A new test being developed at the College of Medicine to help detect respiratory disease in children has received funding from the Western Economic Diversification Canada program. Dr. Darryl Adamko, a pediatric pulmonary specialist, has received $235,000 to develop and commercialize a test to improve the testing, and subsequent treatment, for pulmonary diseases such as asthma and Chronic Obstructive Pulmonary Disease (COPD). His research focuses on a urine-based test that can not only improve diagnosis, but help to ensure the patient receives the appropriate, long-term treatment. “The goal of this research is to create an objective test to diagnose asthma versus other respiratory diseases that might look like asthma,” Adamko continued. “(But) also to determine whether asthma is being well controlled or not – so whether the therapies are working. 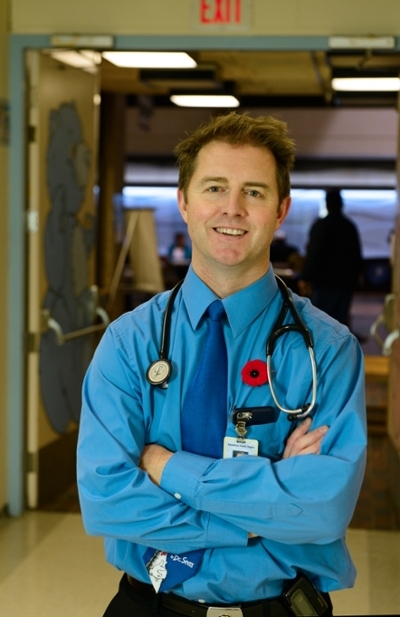 Adamko, who graduated from the CoM in 1993, has a strong research-based history in working with asthma after having completed a pediatric pulmonary fellowship at Johns Hopkins University in 2001, and working as an associate, and then adjunct, professor at both the University of Alberta and now at the University of Saskatchewan. And it’s that interest in helping to fill the gaps in diagnosis and treatment that has earned Adamko the funding from the WEDC.